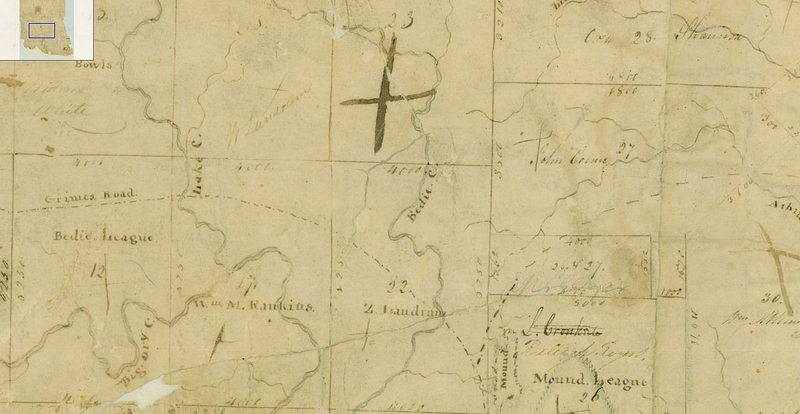 Map/Doc #: 79, Title: [Surveys in Austin’s Colony along the west bank of the San Jacinto River], Region: Austin’s Colony, Citation Date: , Surveyor: [E. R. Wightman], Texas General Land Office, Austin, Texas. 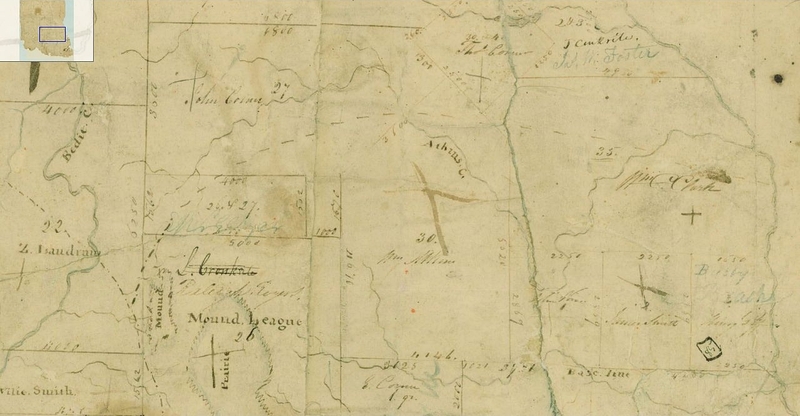 On this enlargement of the 1831 map, the Coshatta [Coushatta] Trace is identified on the League numbered 25. 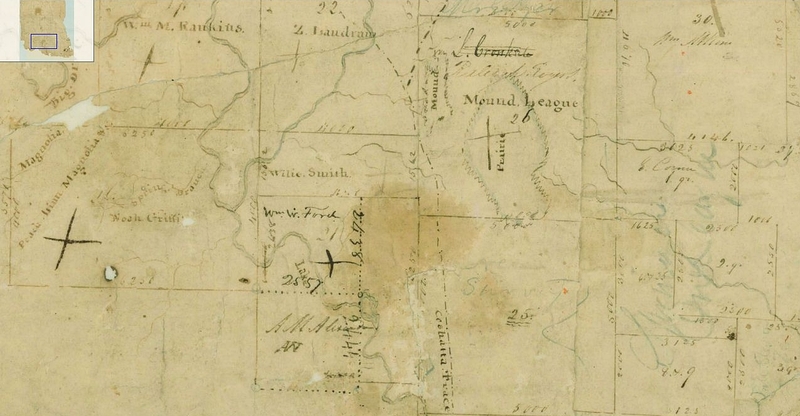 This is a wonderful closeup of the E. R. Wightman's 1831 survey map showing the Coshatta [Coushatta] Trace running north and south on the Raleigh Rogers League [Iron Mound League] then onto the Z. [Zachariah] Landrum League and then back over onto the Rogers League. Then the Coushatta Trace begins to turn east so that it runs east and west as it crosses the John Corner League, the on the Wm. [William] Atkins League, the Wm. [William] C. Clark League and then crosses the West Fork of the San Jacinto. This map clears up some of the confusion caused by Wightman's English Field Notes for the Raleigh Rogers League. 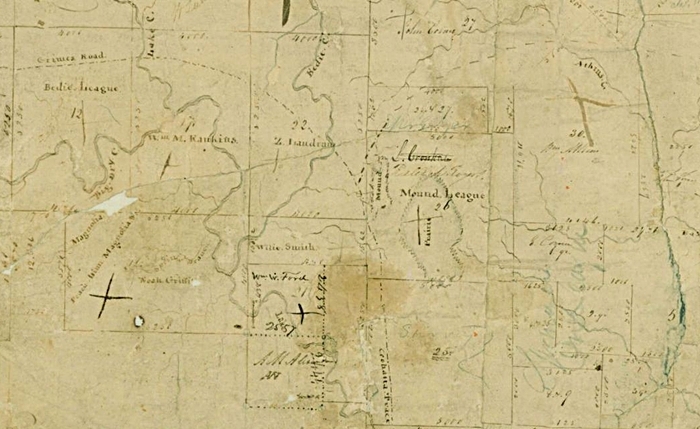 On this enlargement of the 1831 map, we see the Grimes Road labeled as such on Bedie [Jacob Shannon] League.